Normally I only use natural materials, but this resin claw is quite realistic, and there's no way I'd take a poor bear's toes! The claw is captured in a net of 3-drop gourd stitch. The claw pendant unhooks to make the necklace more versatile. The beautiful woodland path scene in the centerpiece reminds me of the bear's natural habitat. I believe the beautifully cut centerpiece is jasper, I have no idea where it came from or how long I've had it, but the colors and image are perfect for this piece. (It's so strange how you just know you'll need that piece someday!) 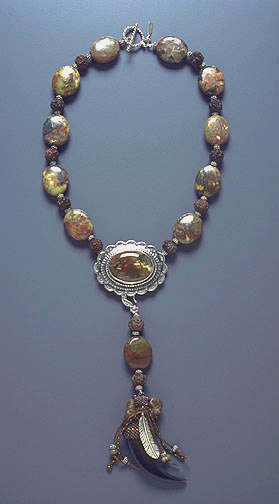 The yellow turquoise beads have the same gorgeous woodland colors. It is signed and dated. A little editorial on 2-drop and 3-drop: I've seen several beadwork articles recently which show an entirely different stitch as "3-drop peyote." (As discussed in another page on this site, gourd stitch and peyote stitch are the same thing, the latter term is reserved to describe Native American Church ceremonial objects.) I learned 3-drop from a Lakota teacher, David Whitehorse. We studied magnificent Native American Church fans and rattles and also the Whispering Wind article from many years ago which describes the stitch. I also have old graph paper from Western Trading Post labeled 3-drop which uses the same definition David taught us, and more recently David Dean also published similar 3-drop graph paper. This 3-drop stitch allows more complex designs than the more common 2-drop, and should not be confused with other methods which attach more than one bead at a time. In the form of 3-drop used here, each bead is individually attached as in 2-drop, the distinction is in the thread path.